1 It was the hottest campout the club had ever had. It was hard to think back to how cold it had been just a few months ago because now it was boiling hot. Most people stayed inside their air-conditioned RVs. Some ventured out to take dips in the lake, but even the lake water was so warm that it wasn't particularly refreshing. 2 Sally was glad that the club had decided to make their own ice cream. The campers usually had one meal together, and they had chosen to ask everyone to bring cool salads and meat plates. Those who had portable ice cream makers were asked to bring them along. 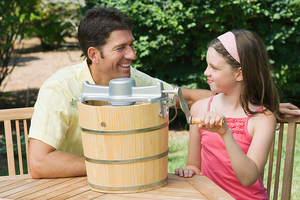 3 Earlier on Saturday, several of the camping families had taken out their ice cream makers and began to prepare their favorite flavors. The Johnsons were doing chocolate. The Browns were preparing strawberry. The Jones family went with vanilla. Sally went around to all the campsites and enjoyed talking with each of the families. Some had gotten fresh fruit and were including it in their ice cream. The dessert bar would be delicious. 4 After returning to her campsite, Sally began to think about the upcoming meal. She wondered if anyone had thought about getting toppings for the ice cream. She asked her mom and dad, who were acting as hosts for this weekend, about it.